So, what is Haikyuu!! exactly? Who’s the author? Is it very popular? Haikyuu!! is the sport Japanese manga series written and illustrated by Haruichi Furudate. The manga was serialized in Weekly Shounen Jump since February 2012, and the tankobon were published by Shueisha in Japan and by Viz Media in North America. The popularity of the manga has brought it into anime adaptation. So far, Haikyuu!! has already had 3 seasons which make it has 60 episodes in total. Just like the manga, the anime also gains huge popularity among anime lovers all around the world, flies like a raven!!!! The anime television was produced by Production I.G. which aired from April 2014 to September 2014, the second season aired from October 2015 to March 2016, and the third season aired from October 2016 to December 2016. While the forth season is still unknown, but I’m sure you will find the next season of the anime considering both of the manga and anime are very popular. The blu-ray was released by Sentai Filmworks on June 2, 2015. Hinata Shouyou is not a big guy, but he is got huge objectives and ambitions. Ever since witnessing a small player score in a National Championship, he is been determined to turn into the next big thing in High School Volleyball. Sadly, the one time he was able to pull enough players together to create a team in junior high, they were entirely wiped out in their first and only match against a team led by genius setter Kageyama Tobio. Now, enrolled at the same high school where his idol once played, Shouyou’s ultimately going to get his shot to join and play with a top team. There is only one problem that Kageyama Tobio is also choosing to attend the same school, and he is already regarded as one of the best players in the game. Story: Much like some other sports anime, it tells a story of wish and dreams but a very important factor that sets it apart from other sports anime is the authentic nature of it. Without any supernatural techniques such as in Kuroko no Basket, Haikyuu successfully make the characters’ development as realistic as they can. Hinata’s fast reflexes, Tobio’s accurate tosses, and Nishinoya’s excellent saves can be accomplish in real life with years of practice and dedication to the sport. 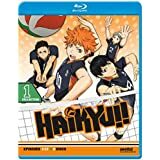 What impressed me more than the other sports anime I’ve watched, Haikyuu provides the message that nothing is impossible with wonderful work and dedication like Hinata’s height problem, but nonetheless does a great job in the sport he really loved. And they wonderful portray of what a captain really is, Daichi! To never breakdown, to never give up, and to hold the team until the end. The other thing that makes Haikyuu different is the fantastic display of volleyball as not just a mere sport but a battle that can only win with a connected team. Tobio personality brings this message into light as he little by little finds out himself to play as a team, not an individual and rely on his teammates in the match. He even had the very best partner and rival he can ever wishes for, Hinata! Artwork: The artwork could be very sophisticated. It does not look half-done at all (which was the matter I had with many sports anime) and the characters really look different, instead of having all the same face but with various hair and eye color. Some have soft features, some have sharp, and they are all built differently so they really look like a group of real people. Sound: The soundtrack of this show is very good. It suits the mood truly nicely and the tone of some of the OST may be very relaxing but also sometimes extremely terrifying and suspenseful. The animation studio does such a wonderful job in syncing it correctly with the mood of the show which is why it is fantastic. 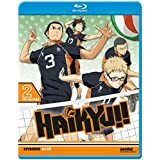 Overall: Haikyuu can be an emotional ride of laughter, tears, and frustration that you can feel from characters, whether main characters or extra-characters. Synopsis: As the story progresses the team grows. Certainly their individual abilities improve as well but that is beyond the point. one of the main characters, Hinata Shouyou, is a good example of that. The only time when we have focused on his individual improvement and abilities growth a lot was in one or two episodes. Before that, we were given a timely flashback in the beginning of the first season of how he grew to be what he is today. The first season’s story as well as the second’s focus on the mix plays of the team more than Hinata’s solo improvement. Story: The story maybe is the best one you can find from a sports anime. Of course there is nothing complicated, such as a excellent mystery or an exceptional plot filled with twists and something like that. Nevertheless, it is still great and original. I actually find some background on almost every character, even the supporting characters. The main characters just like water-fire duo, they are opposites of each other but they turn into a single destructive weapon for their team. I also have Hinata’s ambition on his idol “Little Giant” and the rivalry between Oikawa and his partner, Tobio. But overall we have a normal shounen plot. Many action given by a group of friends aiming to become the strongest. Artwork & Sound: Art and sound are all wonderful. Animation was done well by Production I.G., despite nothing was really that remarkable. For sound, the opening themed was very moving and embodied the entire competitive spirit. The seiyuu are decent too for the context of this anime. Enjoyment: Most of you who are reading this Haikyuu!! Anime Review probably are an enthusiast of sports genre. Then you maybe already know that sports genres’ anime are actually enjoyable, especially when there are adorable characters and epic moments to share. These are what Haikyuu anime provides to you. Memorable and great characters, fantastic shounen moments, intensive games featuring factors from comedy to drama.